This Need computer desk which is 47 inch length offers a spacious and efficient workplace for your home or office. Enjoy a beautiful traditional look with smart features for your convenience. The simple square design provides a large durable work surface and just the right amount of storage to keep you feeling neat and organized. 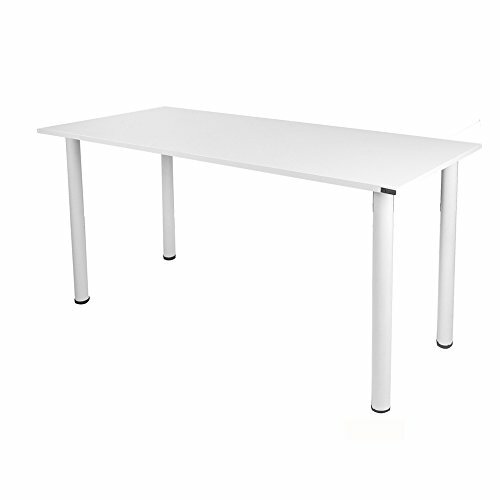 With the large size, it is perfect to use as a meeting table, conference table, working desk etc. The computer desk quality construction meets ANSI/BIFMA test standards for safety and performance. A rich glossy finish provides a simple, elegant and timeless appearance for using. Tips to make the desk more stable: two bolts for each leg, pls make sure both of bolts are fasten alternately. DO NOT fasten one fully first then the other, which would cause the table unstable; 2.While all legs are assembled, do gently waggle the legs and fasten their bolts in turns. Repeat this action 2-3 time to ensure all table legs are installed fully with stable.